My hype to see how Bethesda would interpret all these innovations and incorporate them into the Fallout setting turned to disappointment when I stumbled through a game that features the same poorly-implemented combat and all the same old Gamebryo engine annoyances and glitches we've been dealing with for years. Fallout 4 will provide some good old-fashioned fun for players who are looking for a prettier Fallout 3 (now with Minecraft! ), but it could have and should have been much, much better than that. 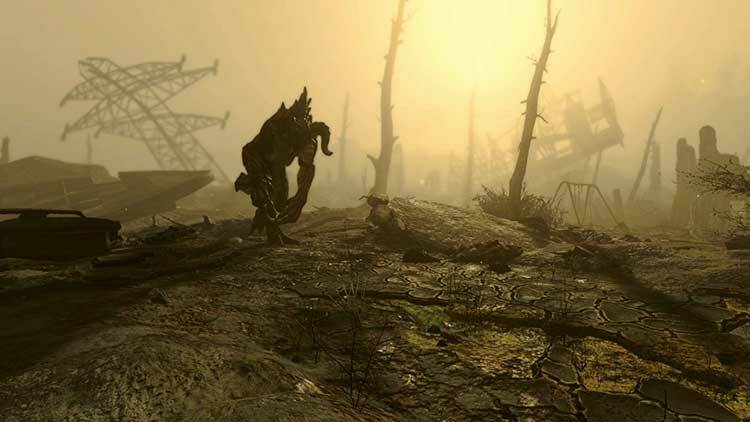 In short, many of Fallout 4's problems, like every Bethesda RPG before it, are a consequence of what makes them unforgettable. That might not be the neatest conclusion, but it explains why, 50 hours in, I'm still having fun. It also explains why, now that I've finished this review, I'm going to play it for many hours more. Fallout 4 is universal. As such, a big part of deciding if you want to play Fallout 4 becomes a personal inventory of your desire to either revel in these glitches or your patience at dealing with them, should they appear. As someone who has really appreciated this line of games in both its Fallout and Elder Scrolls flavors, Fallout 4 was still harder to swallow than I initially suspected it would be. It's another one of those games, for better and for worse. I probably can’t give a higher endorsement of Fallout 4 than this: I’ve spent around 50 hours playing between the console and PC versions, and I don’t feel like I’m anywhere near quitting. And that’s what we want from Fallout, right? A world we can dive into completely and spend days exploring. Well, if that’s what you come to Bethesda products for, you’re going to get it here. I’ve put over 30 hours into Fallout 4 already, and I’m nowhere near finished with all the game has to offer. I plan on taking my time and working my way through all of the wasteland beyond the final main story mission, because the game allows that to happen seamlessly. DLC and future content updates are bound to come, and I can’t wait to see what the mod community does to this game either. Fallout 4 has all the ambiance and history that made its predecessors such wonderful places to get lost for hours at a time, with a much more coherent set of stories within it. That Bethesda has integrated a major building and crafting tool while finally building a great-playing game almost feels like a bonus. 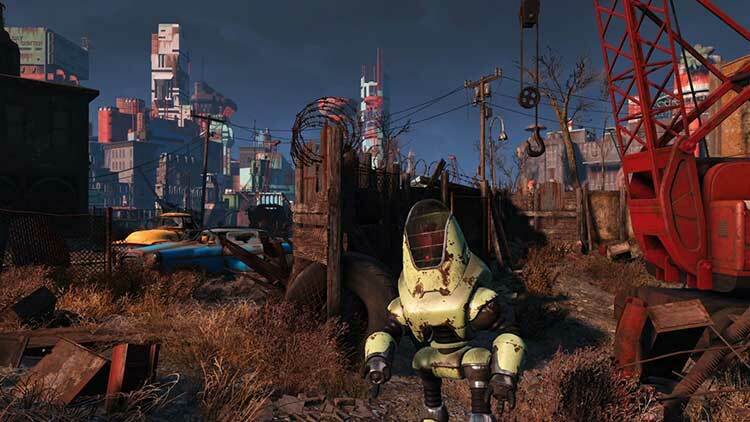 In the grand scheme of things, Fallout 4's minor issues pale in comparison to its successes. When you put the controller down, you think about the friend you betrayed to benefit another, the shifting tide of an incredible battle, or the moment you opened a drawer and found someone's discarded effects, making you wonder how they felt before the bombs fell. In moments like these, Fallout 4 can be an intoxicating experience. Fallout 4 contains what should go down as the best open world in the history of this medium considering the sheer wealth of meaningful content packed into it. Some people flock to sandbox games in hopes of checking off boxes, collecting garbage and simply passing time, and Fallout 4 feels like the strongest middle finger to this contingent in years. Those expecting a pure AAA, next-gen experience, an innovative product that pushes the genre forward and sets the bar high, or a flawless diamond, will be disappointed. Fallout 4 will not create an industry revolution, and it won't leave the rest of the competition in the dust - but it's a great game, nonetheless. It's better than previous Bethesda creations in some ways, inferior in others, but overall, it's another wonderful addition to the franchise; addicting, immersive, spellbinding. Fallout 4 is a superb game, with a huge and compelling game-world to explore, entertaining combat, and many quests that’ll keep gamers hooked for over a hundred hours of single-player-only fun. Yes the story is literally forgotten the moment you leave it (what son? ), but other than that everything great about Fallout 3 is back in the sequel… which is both a blessing and a curse. 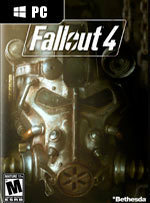 Fallout 4 has been much anticipated and there's been growing excitement and towering expectations building around it, but this is a game that lives up to the hype. It absolutely delivers. The amount of content is overwhelming, and every part of the game feels complete, from building cities through to exchanging fire with the bandits found in the wilderness. 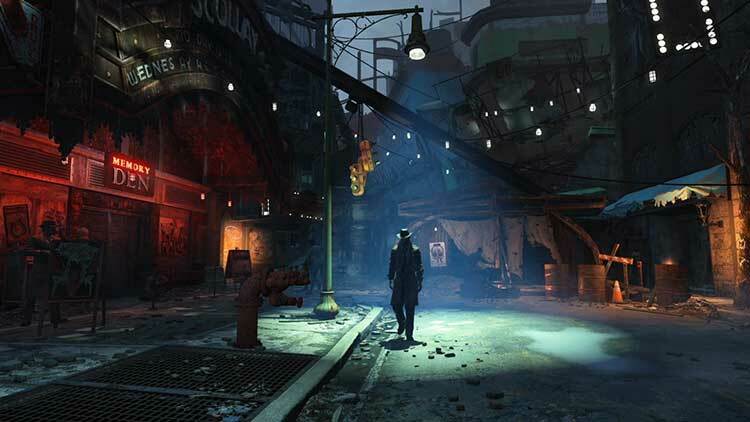 Fallout 4 is a welcome return to the wasteland. An interesting and well-told central story is hobbled by the open world, but this is Fallout and that open world is a joy to explore. PC players will justifiably grumble that the game is obviously designed first and foremost for a couch and controller experience. Ofrece decenas y decenas de horas con un mundo maravillosamente recreado, con una gran densidad de contenido y siempre algo satisfactorio que ofrecer. Uno de esos juegos agradecidos de tu dinero con el que puedes pasar mucho tiempo explorando y descubriendo sus posibilidades -por no hablar del potencial de mods, siempre tan importante en el éxito de un título de Bethesda-. Ich mag seine stimmungsvolle Welt, ich mag seine Androiden-Story, ich mag seinen Humor und seine Freaks. Hier stecken zudem mehr liebevolle Details drin, als es auf den ersten Blick scheint, etwa die Zufallsbegegnung mit »Arschgesicht« oder die Dungeons-&-Dragons-Atomforscher-klasse! Und dennoch…dennoch hinterlassen fast 100 Stunden Fallout 4 bei mir das flaue Gefühl, das mehr drin gewesen wäre, dass Fallout 4 weder sein Universum noch seine Story-Prämisse voll ausschöpft. Fallout 4 lässt mich versinken und versacken, bis mich die Müdigkeit ins Bett zwingt. Die Sogwirkung dieser Endzeit ist fast schon unheimlich. Und das, obwohl es klare Defizite gibt: Von der schwachen KI über ärgerliche Bugs bis hin zur steifen Mimik sowie Steuerungstücken. Aber dieses Rollenspiel zieht mich gnadenlos in seine apokalyptische Welt, weil ich ständig neue Quests, interessante Charaktere und Orte kennenlerne. Malgré ces écueils qu'il faut tout de même souligner, Fallout 4 fait partie de ces jeux qui ont cette force en eux capables de nous hypnotiser dans leur monde, grâce notamment à son ambiance unique, cette sensation de liberté totale, sa qualité d'écriture et sa durée de vie phénoménale. Bref, un jeu à ne rater sous aucun prétexte si vous accrochez à l'univers et aux RPG occidentaux. L’univers, l’exploration, la construction, l’atmosphère et l’histoire de Fallout 4 sont autant d’éléments déterminants dans cet immense jeu de rôle vraiment réussi. Il y a de bonnes raisons de chercher des reliques des temps heureux, des compagnons très forts et des méchants sympathiques, chacun menant à des décisions difficiles pour un tout exceptionnel et une aventure que je prendrai plaisir à rejouer. Bardé de défauts parfois gênants pour la progression, techniquement pas toujours au point et rappelant beaucoup ses prédécesseurs sur bien des aspects, Fallout 4 remplit néanmoins son contrat haut la main. Avec un contenu bien dodu, quelques fonctionnalités qui le rendent encore plus intéressant que ses ainés ainsi qu'un style qui ne se démode pas, le RPG de Bethesda étreint le joueur chaleureusement dès les premiers instants pour ne plus lui donner envie de partir. 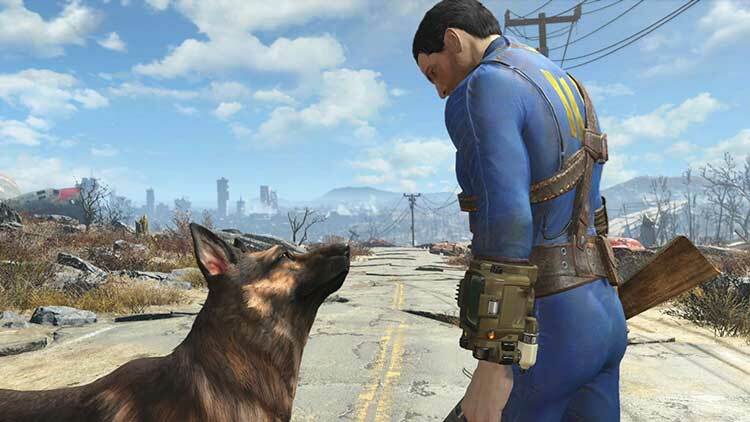 Chi al day one temeva un Fallout 4 disastroso e al limite dell’ingiocabile si metta pure il cuore in pace. Bethesda ha infatti realizzato una versione per PC stabile, solida e ben ottimizzata (soprattutto a livello di CPU), che permette di godersi un valido mix tra prestazioni e qualità anche con hardware di medio livello. Pochi i bug e rarissimi i fenomeni di stuttering e solo se volete giocare in Full HD a 60 fps granitici con tutto maxato, procuratevi qualcosa di più potente della nostra GTX 770. 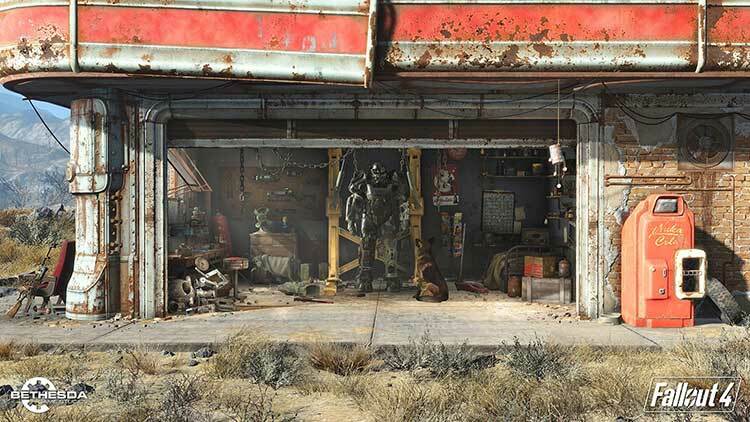 Fallout 4 su PC è lo stesso mastodontico titolo visto su console. 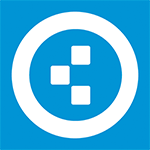 Ecco, è proprio lo stesso, nel senso che le caratteristiche di questa piattaforma sono state sfruttate pochissimo, sia dal punto di vista tecnico che da quello strutturale (interfaccia, configurabilità e così via). È per questo motivo che abbiamo scelto di penalizzarlo nel voto, perché sinceramente ci saremmo aspettati un po' di attenzione in più, soprattutto dopo le faraoniche vendite di Skyrim. За счёт своего мира, духа исследования, особой атмосферы и хорошего сценария Fallout 4 получилась очень большой и очень удачной ролевой игрой. А благодаря интересным напарникам, не лишённым человеческих чёрт злодеям, непростым выборам и множеству причин для сбора и соединения воедино реликвий прошлого я почти уверен, что обязательно буду возвращаться в этот мир. Даже технические проблемы, всплывающие то здесь, то там, не в состоянии подкосить этого колосса. Den riktiga Falloutkänslan är där. Världen känns öde samtidigt som den är fylld av saker att upptäcka med hemligheter som lurar bakom varje hörn. Dynamiken är levande med monster och människor som delar utrymme i en miljö ingen kunde fantisera om. Och även om grafiken är undermålig så njuter jag när jag vandrar runt med min hemmasnickrade pistol.